When respondents were asked about which BI products they evaluated, Qlik came top of the list with 36% evaluating it, followed by all of the Microsoft products (Excel/Power BI at 35%, SSAS at 28% and SSRS at 26%). However when it came to picking products Excel/Power BI came top at 25%, followed by ‘other’ products, then SSAS at 21% and SSRS at 17% with Qlik at 16%. I wonder what parts of the Power BI stack the Excel/Power BI users were actually using exactly though? I suppose the point about it is that users can take whatever parts of it they want to complement what they do in Excel. These numbers are very encouraging in any case. Looking at reported usage problems for MS products some familiar issues came up: 25% of Excel/Power BI users complained that the product couldn’t handle the data volumes they wanted and 16% complained of security limitations – both scores were the worst across all products. Partly this can be explained by the desktop-bound nature of the product, but I wonder whether the limitations of 32 bit Excel are behind the data volume problems? Also, 18% of SSRS users complained of missing key features, which again was the worst score for this category across all products. I hope MS plans to show SSRS some more love in the future after several years of neglect. Other products have other weaknesses of course – 26% of Tableau users had administrative problems, 53% of SAP BW users had problems with slow query performance and 21% of TM1 users had issues with poor data governance. Nothing is perfect. 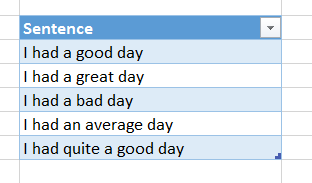 Respondents were asked about cloud BI adoption. For those using Excel/Power BI, 15% were in the cloud now (the third best score across all products) which I assume means they are using Power BI for Office 365; a further 15% were planning to go to the cloud in the next 12 months; a further 19% were planning to go in the long term; and 51% had no plans. Presumably this last group of users would like to see more of the Power BI for Office 365 functionality implemented within SharePoint on premises. 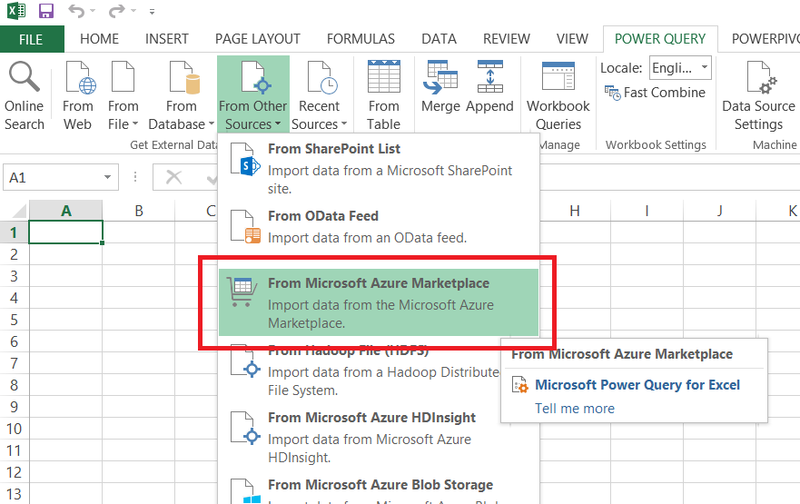 You may have seen Joseph Sirosh’s blog post last week about the ability to publish Azure Machine Learning models to the Azure Marketplace, and that MS have published a number of APIs there already. 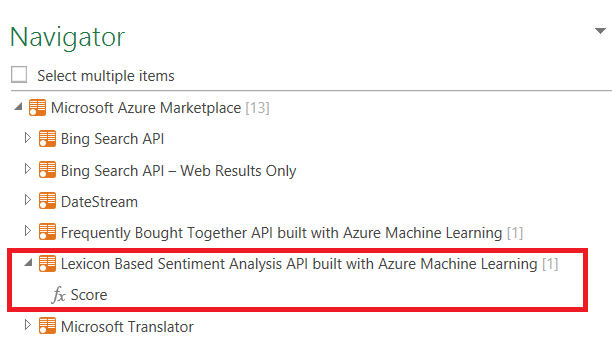 There’s a new Excel add-in that can be used with these APIs but I noticed that at least one of them, the Sentiment Analysis API, can be used direct from Power Query too. You’ll then be prompted to set a data privacy level for the data you’re using, because calling this function involves sending data from your worksheet up to the API where someone could potentially see it. 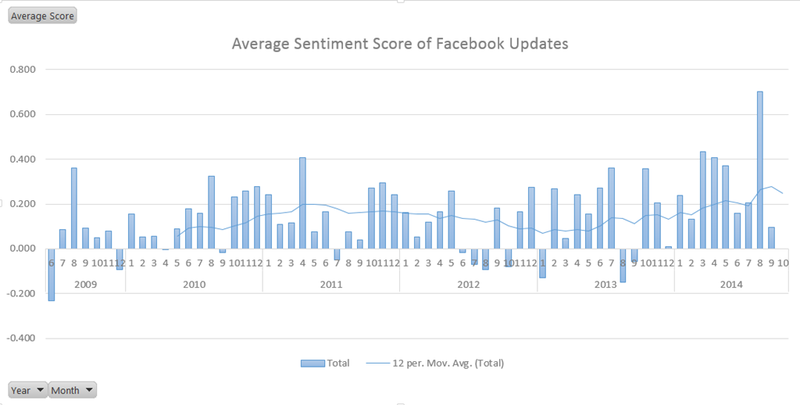 As you can see, I was in a particularly good mood this August – probably because I was on holiday for almost the whole month. Solve order in MDX is a mess. Back in the good old days of Analysis Services 2000 it was a difficult concept but at least comprehensible; unfortunately when Analysis Services 2005 was released a well-intentioned attempt at making it easier to work with in fact ended up making things much, much worse. In this post I’m going to summarise everything I know about solve order in MDX to try to make this complicated topic a little bit easier to understand. If you’re an experienced MDXer, at this point you’ll probably lose interest because you think you know everything there is to know about solve order already. Up until two weeks ago that’s what I though too, so even if you know everything I say in the first half of this post keep reading – there’s some new stuff at the end I’ve only just found out about. Solve order controls the order that MDX calculations are evaluated when two or more of them overlap in the same cell. In this case Cost % and Total Fruit are both evaluated in the bottom right-hand cell; Total Fruit is calculated first, giving the values of 30 for Sales Amount and 21 for Cost Amount, and Cost % is calculated after that. The bottom right-hand cell is the only cell where these two calculations overlap and the only cell where solve order is relevant in this query. Now the value in the bottom right-hand corner is 135% instead of 70%: Cost % is calculated first, then Total Fruit second so 60%+75%=135%. The SOLVE_ORDER property of a calculated member is an integer value, and the lower the SOLVE_ORDER value the earlier the calculation will be evaluated, so with Cost % having a solve order of 1 and Total Fruit having a solve order of 2, this forces Cost % to be calculated first now even though in this case it gives what is clearly an ‘incorrect’ result. Of course, if Total Fruit is defined on the cube and Cost % is defined in the WITH clause you will get the correct answer. However, usually measures like Cost % are defined on the cube and it’s calculations like Total Fruit, which define custom groupings, that are defined on an ad hoc basis in the WITH clause. This is a problem. The general rule is, therefore, whenever you are creating custom-grouping type calculated members like Total Fruit in the WITH clause of a query, to use the Aggregate() function rather than Sum(). The fact that Aggregate() takes into account the AggregateFunction property of each measure on the cube (so that distinct count, min and max measures are dealt with correctly) is another good reason to use it. There are some very interesting details about the way Aggregate() changes solve order though. The value returned for the calculation [One Aggregate One Sum], which contains an Aggregate() and a Sum(), shows that the value returned by the Aggregate() is evaluated at a different solve order than the value returned by Sum(), even if they are inside the same calculated member. Furthermore, in some very obscure cases the contents of the set passed to the Aggregate() function determine whether its special solve order behaviour happens or not. I don’t know for sure what all those cases are but I have seen this happen with time utility (aka date tool aka shell) dimensions. Here’s an example. Note that for some of the calculations, the Aggregate() function results in a lower solve order in the way we’ve already seen, but not for all of them. Using the NextMember() function, or having two Descendants() functions without wrapping them in a Union() function, seems to stop SSAS assigning the calculation a lower solve order. Ugh. Luckily, though, I have only been able to replicate this with calculated members from two non-measures dimensions; if Cost % is a calculated measure Aggregate() always gives the lower solve order. Apparently this is something that SSAS does on purpose to try to recognise ‘visual total’-like calculated members and make them work the way you want automatically. This is definitely something to beware of if you are using time utility dimensions and calculations on other dimensions though, as it may result in incorrect values being displayed or performance problems if you’re not careful. When I first saw the announcement about Office Sway last week, I thought – well, you can probably guess what I thought. Does it have any potential for BI? After all, the Sway team are clearly targeting business users (as well as hipster designers and schoolchildren): look at the Northwest Aquarium and Smith Fashion Expansion samples, and notice that they contain tables, charts and infographics. What’s more, data storytelling is currently a very hot concept and Sway is clearly all about telling stories. Wouldn’t it be cool if you could have interactive PivotTables, PivotCharts and Power View reports from your Power BI site embedded in a Sway? It would be a much more engaging way of presenting data than yet another PowerPoint deck. I have no idea whether any integration between Sway and Power BI is actually planned (I have learned not to get my hopes up about this type of thing), but even if it isn’t maybe someone at Microsoft will read this post and think about the possibilities… And isn’t this kind of collaboration between different teams supposedly one of the advantages Microsoft has over its competitors in the BI space? 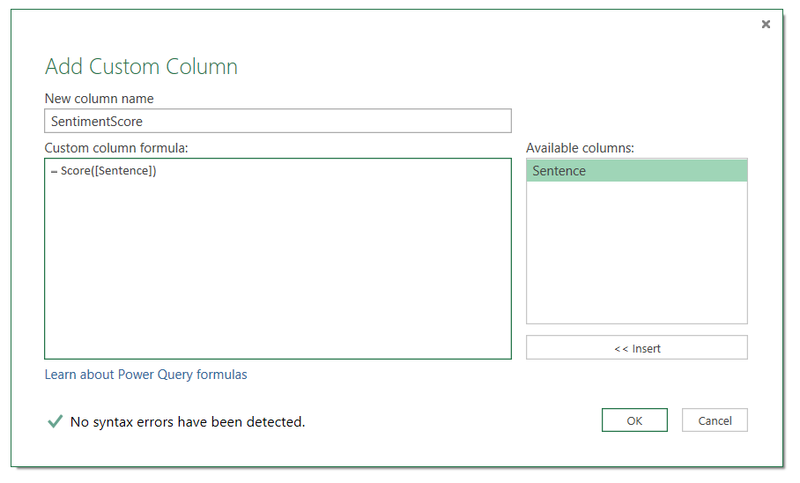 A few months ago someone at a conference asked me what the Power Query Table.Partition() function could be used for, and I had to admit I had no idea. However, when I thought about it, I realised one obvious use: for creating histograms! Now I know there are lots of other good ways to create histograms in Excel but here’s one more, and hopefully it will satisfy the curiosity of anyone else who is wondering about Table.Partition(). After loading the data from the Excel table in the Source step, the first problem is to determine how many buckets we’ll need. 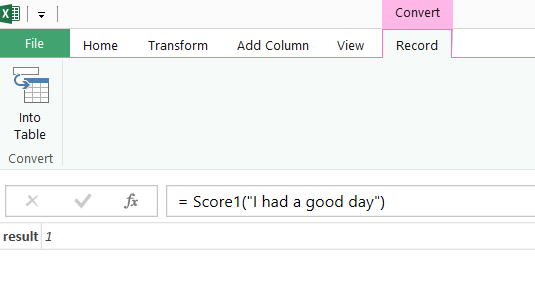 This is fairly straightforward: I use Table.Column() to get a list containing all of the values in the Age column, then use List.Max() to find the maximum age, then divide this number by ten and round up to the nearest integer. Now for Table.Partition(). The first thing to understand about this function is what it returns: it takes a table and returns a list of tables, so you start with one table and end up with multiple tables. Each row from the original table will end up in one of the output tables. A list object is something like an array. One of the parameters that the Table.Partition() function needs is a hash function that determines which bucket table each row from the original table goes into. The BucketHashFunction step serves this purpose here: it takes a value, divides it by ten and rounds the result down; for example pass in the age 88 and you get the value 8 back. 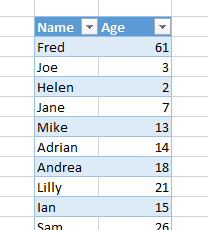 The next thing to do is to convert the list itself to a table, then add a custom column to show the names for each bucket. This is achieved by adding a zero-based index column and then using that index value to generate the required text in the step #”Added Custom”. Next, find the number of customers in each bucket. 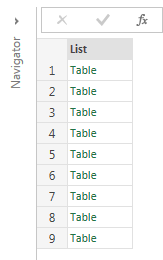 Remember that at this point the query still includes a column (called “Column1”) that contains a value of type table, so all that is needed is to create another custom column that calls Table.RowCount() for each bucket table, as seen in the step #”Added Custom1”. Finally I remove the columns that aren’t needed for the output table. I’m not convinced this is the most efficient solution for large data sets (I bet query folding stops very early on if you try this on a SQL Server data source) but it’s a good example of how Table.Partition() works. What other uses for it can you think of?